Side loading forklifts, which are also known as sideloader lift trucks, are used for lifting, transporting and unloading long, heavy and awkward loads through narrow warehouse aisles. Around since the 1950s, side loading forklifts are typically found in steel service centers, lumber yards and other businesses where lengthy or bulky items need to be moved through tight passages. Unlike ordinary forklifts, the side loading lift operator stands sideways in the lift’s cabin, which gives him or her a clear view in all directions. 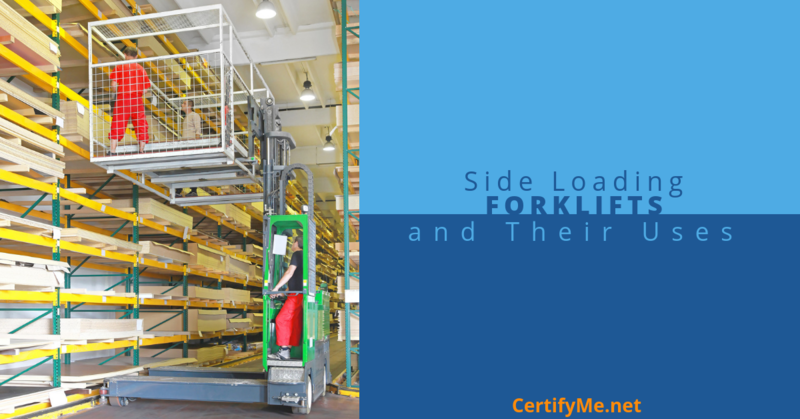 Side loading forklifts have also come to be known sideloaders because unlike standard forklifts, their forks are located on the side rather than the front. Since side loader forks are extended with a scissor mechanism, they never need to turn in an aisle. This means they can be almost the same width as the aisle itself. Intended primarily for indoor use, side loaders can also be used outside. Side loading forklifts come in both man up and man down models. Cabins on man down forklifts are fixed to the vehicle’s body, while cabins on man up side loaders are raised and lowered with the forks. Man up sideloaders allow the operator to combine pallet handling tasks with order picking and inventory retrieval. When used for order picking, the man up version has the additional advantage of placing the operator near the items being retrieved. Sideloader bed lift lengths are adjustable, and can be configured to perform various tasks. Most sideloaders can also be adjusted for lift capacity, mast height and fork length. Optional accessories include lights, mirrors and similar add-on safety equipment. Side loading forklifts come in models powered by batteries, diesel or liquefied petroleum gas (LPG). Benefits of sideloaders over regular forklifts include faster travel speeds and better maneuverability in tight spaces. Because they give the operator greater visibility, they’re also safer to operate. There are also some disadvantages to sideloaders. With the exception of when working in narrow aisles, side-loading forklifts are generally less maneuverable than standard forklifts. Because they’re specialized pieces of equipment, it’s sometimes necessary to purchase accessories or attachments for handling and moving different load weights and types of materials. Multi-directional forklifts provide a one-vehicle solution that can be used for a variety of tasks. They combine the features of sideloaders, very narrow aisle (VNA) vehicles and counterbalanced forklifts in a single piece of equipment. As with sideloaders, multi-directional forklifts are available in battery-operated, diesel and LNG powered versions. Since they’re suitable for both indoor and outdoor work, multi-directional forklifts reduce or eliminate the need for keeping multiple vehicles onsite, which minimizes the size of the company’s fleet. Multi-directional vehicles also free up storage space and improve overall operating efficiency. Some examples of multi-directional forklifts are those made by Combilift, Manitou and Bendi. As with other forklift and aerial lift workers, OSHA requires side lift operators to be properly trained and certified before they’re allowed to use the equipment. It’s the responsibility of the employer to ensure that all side lift operators have been properly trained. Failure to do so can result in substantial fines from OSHA. Worse yet, side loading lifts in the hands of untrained workers can result in workplace accidents causing serious injuries or even death. The fastest most convenient and affordable way to certify side lift operators is through CertifyMe.net’s online forklift operator training. Our 100% OSHA-approved program can train and certify your employees in as little as an hour using a smartphone, tablet, laptop or other digital device. All class materials are available online 24/7, so training can be completed any time and anywhere that’s convenient, so long as there’s an internet connection available. CertifyMe graduates also receive free lifetime renewal training, which OSHA requires every three years. To get started today, contact us online or call us at (602) 277-0615.